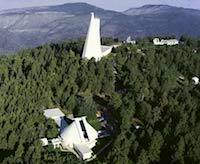 In the heart of "Astronomy Country"
New Mexico is one of the world's leading centers of astronomical research. The state is host to two national observatories, three national laboratories, and three state universities that operate vigorous astronomy programs. 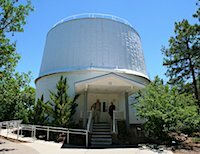 Apache Point Observatory is the site of the Sloan Digital Sky Survey, and, along with the National Solar Observatory, operates a popular visitor center for the public. Amateur astronomers from around the world plan vacations to take advantage of New Mexico's dark skies, protected from light pollution by a state law enacted in 1999. Socorro hosts the National Radio Astronomy Observatory, which operates the world-famous Very Large Array (VLA) and Very Long Baseline Array (VLBA) radio telescopes. The VLA Visitor Center welcomes visitors from around the world all year long. 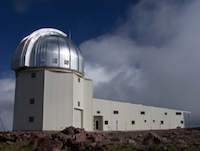 Socorro's New Mexico Tech, a nationally-recognized research university, operates the 2.4 meter telescope that comprises part of the Magdalena Ridge Observatory, which sits atop South Baldy (10,500 feet), about 25 miles west of Socorro. Also located at the Observatory is the beginnings of a 10 element optical Interferometer instrument which will probe the cores of distant galaxies. MIT Lincoln Labs operates the LINEAR observatory a few miles southwest of Socorro, which has broken all records for discovering new asteroids and comets. Socorro also is the ideal starting point for your astronomical vacation tour, less than a day's drive from McDonald Observatory in Texas, the Lowell Observatory in Northern Arizona, and Kitt Peak National Observatory in Southern Arizona. The New Mexico Department of Tourism made a nice little video starring three of our Magdalena Astronomical Society members John Briggs, Judy Stanley and Dan Klinglesmith talking about our dark skies. Not supported by your browser try this. Video by the "New Mexico true" tourism campaign. The YouTube video link for this and more New Mexico videos is here. The site for the star party is located on U.S. Forest Service land about five or six miles north and west of Magdalena. The star party is issued a permit each year and part of the proceeds from registration are "taxed" and given to the forest service. This site had been used for the last five star parties. It's a little dusty, and there can be a little light from cars passing by at night (two or three cars per hour in the evening would be a traffic jam), but there's little obstruction of the horizon, and the layout allows big, tall campers to have their area, and short vans and tents to have their area. Ghosts of star parties past caught on film! "New Mexicans have so many things to be proud of; our clear skies are just one of them. There is no greater place on Earth to view the stars than in Magdalena in mid-April, further reinforcing that New Mexico offers experiences that can be found nowhere else. We're proud to be a part of this event that brings New Mexico True to life in such a unique and beautiful way." "In the blink of an eye I see a world beyond, and worlds that were. The long long long ago is shining before me right now." Click HERE for Danielle's full description of her Star Party experience. Registered participants also have access to an insider's tour of the National Radio Astronomy Observatory's Very Large Array, located ~25 miles west of Magdalena.